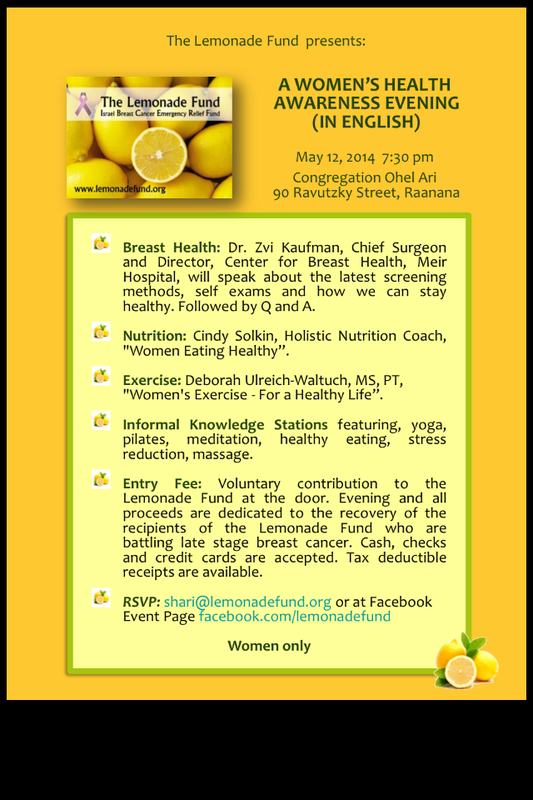 Thanks to all who participated in/helped out at the Lemonade Fund Women’s Health Awareness Evening on May 4th. The event was fun and informative. Some amazing people donated their services and shared their expertise. Worth getting to know them! raising awareness about hereditary Breast and Ovarian Cancer. A supportive community for BRCA gene carriers. 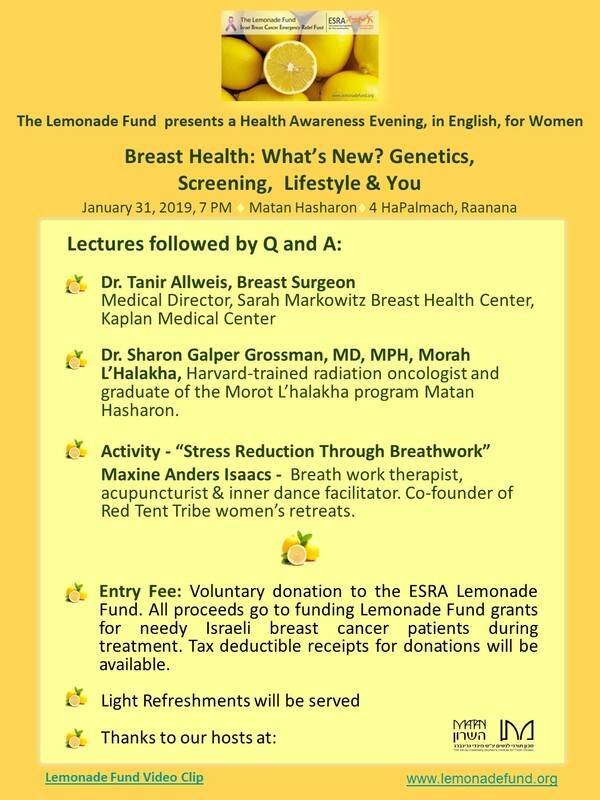 Discover the blessing of BRCA. I work with individuals couples and families and author of ‘Life’s’. *Individual coaching, group workshops and team facilitation. *Personality portraits and personal development planning. Massage, accupuncture, aromatherapy, Shiazo, Thai Massage. Life coaching through stress management, fear, overwhelming, giving tools and skills to teach dreams and goals. MediCope is a mobile digital companion for chronic and serious illness patients. Manufacturer and market for special post-mastectomy clothes and market prostheses, bras and swimsuits. For all your culinary needs, private cooking lessons, group lessons, parties, Bar and Bat mitzvah groups, workshops and demonstrations at every level. Sarah Raanan is a boutique family portrait photographer based in Raanana. Ergonomic (work &home) consultation, pain management, hand therapy and safety advice for seniors in their home. Professional foot treatments with advanced European technology, for men and women. Flowers were very kindly donated to the lemonade fund on the night of the event. 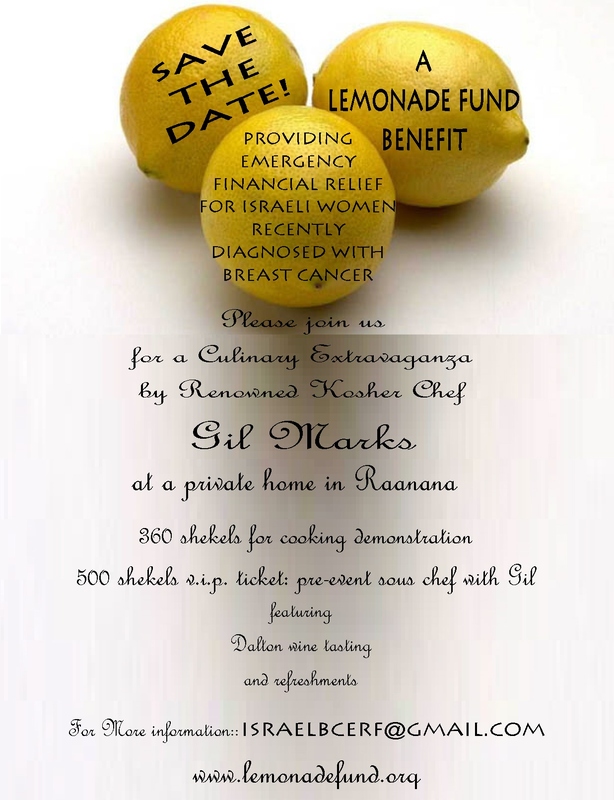 Fruit and lemons were kindly donated by Hameshek to the lemonade fund on the night of the event. Would you pay privately for a mammogram? Hidden in the article is the statement that ‘Diagnostic methods these days catch most cases of breast cancer that can be effectively treated, and much of what is picked up by universal screening is over-diagnosis.‘ What are these ‘diagnostic methods?’ (Mammograms and then, if needed, sonograms and MRI’s.) Would all of these ‘effectively treated’ cases be caught if women had to pay for screening out of pocket? How much does a mammogram cost? Anywhere from $500-$2700 is typical. Where is the study showing what percentage of women would forego screening if they had to pay privately for it, and what the impact of this would be on number of diagnoses, and on staging, treatment and mortality? And as for over-diagnosis, another term that medical economists love to tout when talking about mammograms…let’s talk about how to address over-treating rather than over-diagnosis. As one who has been diagnosed with breast cancer as the result of a mammogram, I’d prefer to have been wrongly diagnosed even if it meant having to undergo an unnecessary procedure. I would bet that 100% of the 40,000 or so women who are diagnosed each year in the US and the 4,500 who are diagnosed each year in Israel, would agree with me on this one. One could argue, but the worst part of these discussions is the unintentional fallout. It is confusing women and they are not getting screened. 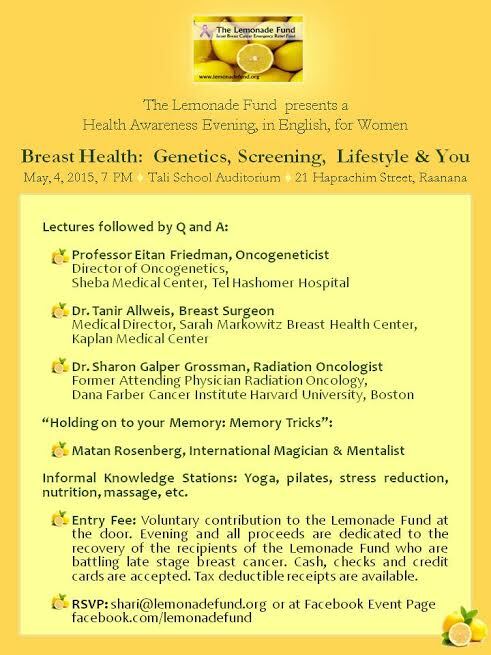 Thie controversy over mammograms will be one of the topics to be discussed at the Lemonade Fund’s WOMEN’S HEALTH AWARENESS EVENT, Monday, May 12 in Raanana. About 1% of breast cancer cases occur in men. The Lemonade Fund received our first application from a young man, S., in his early 30’s, from a community in the north. Sadly, S. has had a recurrence of an earlier bout with breast cancer. In 2006, when he was first diagnosed, he was treated and subsequently went on with his life. This time, S.’s cancer is aggressive and has metastasized to his bones. S.’s wife left him and he is debilitated and currently living with his parents. His social workers report that he is severely depressed. His parents are trying to help him but they are older, and the situation is obviously very hard on them as well. S. is too sick to work and his parents live on a fixed income. There are many additional expenses caused by S.’s illness, and the Lemonade Fund awarded him a grant to help S. and his parents financially, during this difficult time. We pray for his recovery. This is a translation of a 100-year old unconventional cookbook by an immigrant nutritionist with very valid ideas for today’s eating. 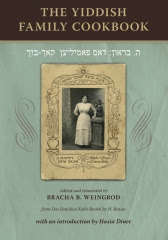 While many of the dishes have been tried, tested and happily devoured, this book is essentially a documentation of a slice of history.Bracha Weingrod is an educator and lover of Yiddish and good traditional food. She taught Yiddish in Winnipeg, Canada, and after her Aliyah in 1974, taught at Yellin Teachers’ College in Jerusalem. She founded and ran the Israel Dyslexia Association, the Kohl Teachers’ Center in Jerusalem and has written and lectured extensively on Hebrew/English learning disabilities. Books (in large print) will be on sale for NIS60. 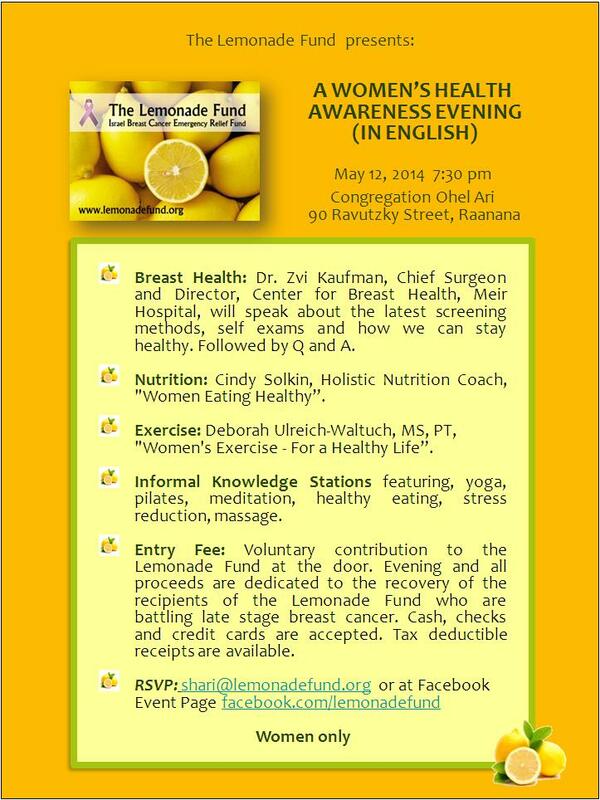 Of this NIS50 is being donated to the Lemonade – Emergency Breast Cancer – Fund.